Vicky Mullaney’s magnificent hunter’s cookbook opens with Meals Before Sunrise—First Flight Apple Dumplings, Bacon and Egg Pie, Straw Basket Bran Muffins (pumpkin/pecan, apple/walnut, cinnamon/blueberry), Hunter’s Breakfast Cups… it’s enough to make you want to crow at the moon. But there’s more to the story. Black Pearl, a private 860-acre working farm not very far from the Blackwater National Wildlife Refuge in Maryland’s Dorchester County, features flooded fields, cropland, marshes, woods, five miles of shoreline private oyster beds­, and waterfowl hunting like it used to be. There, the Mullaneys host very-limited, invitation-only opportunities for sportsmen and women from around the world. 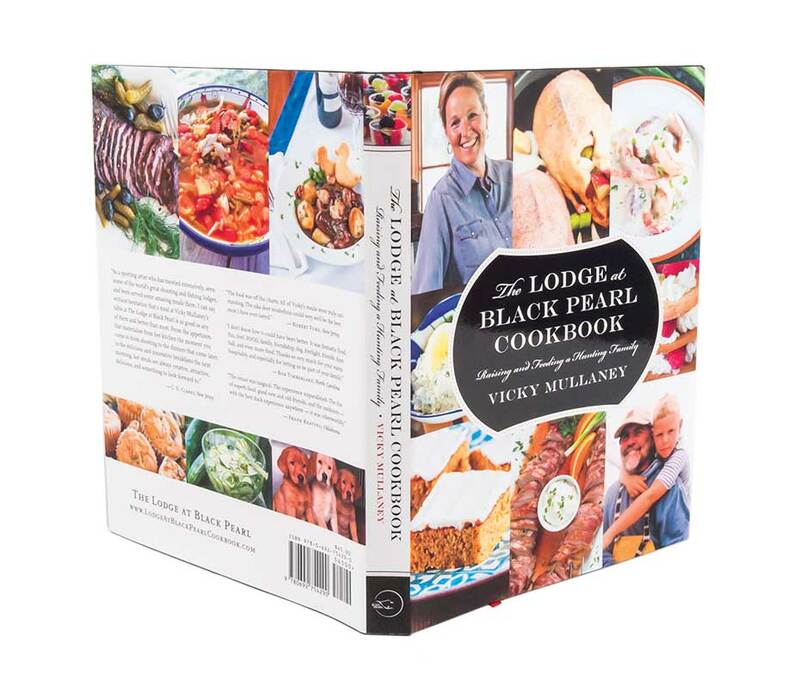 In addition to being a keen hunter and angler, Vicky is the lodge manager, chef, butcher, host, mother of five, grandmother of three. With her husband Stephen, the Mullaneys created Black Pearl—a legacy project and example of what’s possible when you combine intelligent planning, a love of the land and its creatures, and a shared passion for sport. Add in excellent friends such as artists Bob Timberlake, Michael Rosato and C. D. Clarke, and author F. Turner Reuter, Jr., and you have the setting for great conversation over a fine meal after a day afield. It’s unlikely that many or any of us will find a way into a blind at this special place. A very close consolation prize is this 244-page masterpiece, which will guide you through hearty culinary adventures in your kitchen with your ducks, shrimp, venison, oysters, goose breasts, blue crabs, rockfish, breads, pies and what all. Here’s a sampling: Mallard Spring Rolls, Duck Sausage Spears, Quackers & Crackers, Spoonbill Onion Spread, Rockfish Chowder, Venison Cider Stew, Canada Goose in Orange Juice, Goose Strudel, Sika Tenderloin Rolls, Cranberry Chicken, Cinnamon Poached Pears with Ice Cream and Chocolate Ganache and more than a hundred more. The book is scrumptiously illustrated with photography by Melissa Grimes-Guy and annotated by the author with inspiring background on the origins. Available through lodgeatblackpearlcookbook.com, $45 plus shipping.